Many people are under the mistaken impression that maintaining A motorhome is similar to maintaining a car, but this simply isn’t the case. A motorhome is not just a "huge automobile." Nor is it quite a house with wheels. It is somewhere between the two. A motorhome is a type of vehicle that is special in the fact that it is significantly larger and has many more parts to it than an average car. Also, A motorhome is typically driven very long distances, which almost inevitably results in more repairs as it ages and the mileage increases. 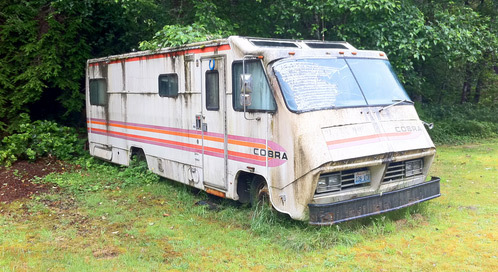 This is why it is so important to buy a quality motorhome that is designed to stand the test of time, and not end up looking like the one below!! Otherwise you may find yourself putting a lot of money into it even shortly after your purchase. There are a few specific approaches to avoid major repairs. One is to buy a Class A motorhome. These tend to be built better structurally so you can avoid the common body deterioration that some in the Class B and C experience. motorhomes in general endure a lot of stress because of the amount of driving that is done in them each year. Every hour you drive your vehicle causes it additional stress. And for some people who travel frequently, the wear and tear becomes evident after a much shorter period of time. By having the roof and metal railings inspected ahead of time with an experienced motorhome technician, you can save a lot of money in future repair bills. You never want to buy A motorhome that has a faulty roof design because it costs thousands of dollars to repair the body structure. Again, have a professional inspection done to make sure that the motorhome you are interested in does not have body damage anywhere. If it does, either attempt to get an accurate repair cost estimate prior to buying it, or move on to the next motorhome. The engine and its surrounding components are the next part of the motorhome that need a thorough inspection. Motorhomes become very hot when driven over a long stretch of road, so you need to make sure the engine on your motorhome choice can endure lengthy hours of highway driving. By verifying the soundness of the transmission - as well as other internals near the engine such as the hydraulic system, air conditioning system, and the brakes - you will save yourself money and headaches. You definitely do not want to break down on the highway with A motorhome in the middle of nowhere! The amount of money you eventually spend on your motorhome repairs will depend largely on the type of motorhome you select. Obviously, the larger it is and the more amenities it has, the greater chance you have of something going wrong. However, the Class A Motorhomes usually are built a bit more reliably and have greater stability than comparable, but less expensive Motorhomes. As long as the motorhome you plan to purchase has a quality inspection by a trained motorhome mechanic, you are well on your way to realizing significant savings from a reduction in the number and severity of repairs over time. And the trips themselves will then be worry free.